The obverse depicted two wheat ears. 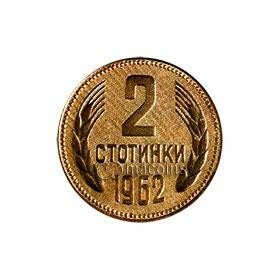 In the center of the coin is the nominal value of 2 stotinki and the year of issue – 1962. The reverse side depicted Bulgaria coat of arms. In the outer circle of the coin has an inscription “Peoples Republic of Bulgaria”. Related links to "2 stotinki"